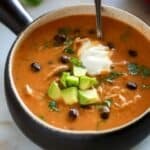 Instant Pot Chicken Enchilada Soup is made with carrots, celery, bell pepper, black beans, and spices. This easy recipe packs a ton of flavor along with healthy protein and fiber. Season the chicken thighs with salt and pepper. Turn instant pot to Saute setting. Add 1 tablespoon of oil to the pan. Add the chicken thighs and sear the chicken for 1-2 minutes on both sides, just until brown. Remove to a plate. Add a little more oil to the pan, scraping up any browned bits. Add onion, garlic, carrots, celery, and bell pepper and saute for 2 minutes. Turn instant pot off. Add the chili powder, cumin, coriander, oregano, and paprika. Stir to combine. Add the chicken broth and diced tomatoes and stir. Add the chicken thighs and corn tortillas (just press the entire corn tortilla(s) into the soup mixture). Cook on Manual/High Pressure for 10 minutes. Allow the pressure to naturally release for 12 minutes, and then do a controlled quick release. Remove the chicken to a plate and shred the meat. (This step is optional, but I really like it to make a smooth soup.) Ladle the soup from the instant pot into a blender, in batches, and blend until smooth. Return pureed soup to the instant pot, along with shredded chicken, black beans, green chiles, and cream. Season with salt and pepper, to taste, if needed. Topping suggestions: green onions, sour cream, cheese, avocado, cilantro, and crushed tortilla chips.